Posted on January 7, 2019 at 4:44 pm. 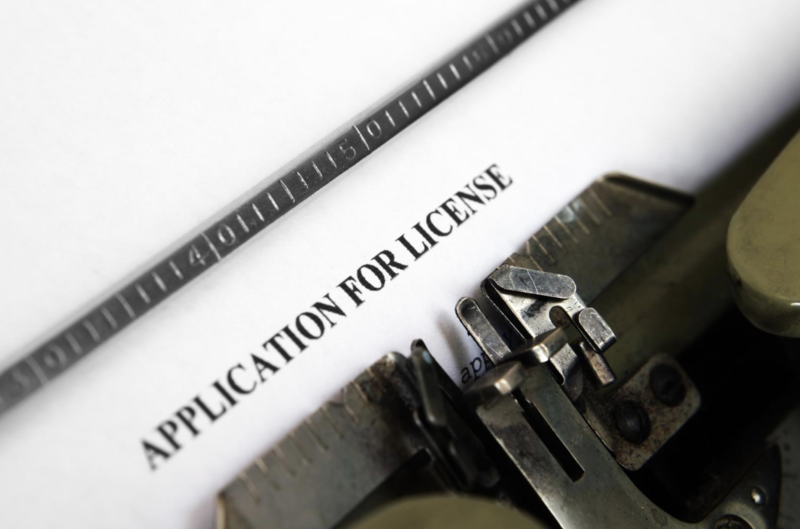 (CNN) “Retail licensing requirements written with cigarettes in mind could be helping lower the risk of teenagers using other tobacco products such as e-cigarettes. According to a study published Monday in the medical journal Pediatrics, teens who live in areas with strong regulations could be at lower risk of tobacco use. 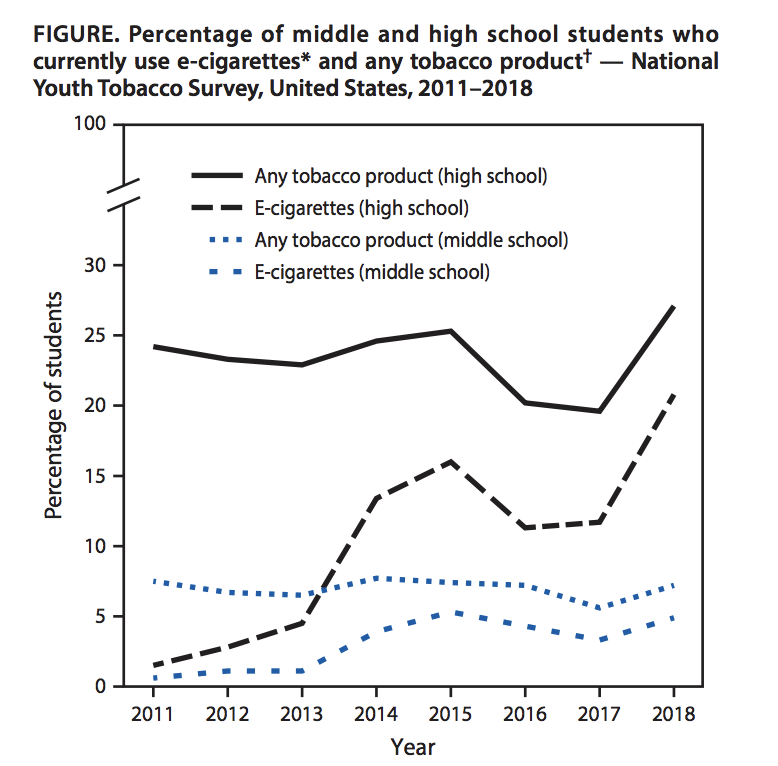 “Youth obtain their product, in part, through retail sales, and if you can do a good job of making sure that youth can’t buy through retailers, the implication is that communities that have that characteristic, that abide by the best standards for retail practices, will have lower rates of use” of all tobacco products, said Dr. James Sargent, a professor of pediatrics in the Geisel School of Medicine at Dartmouth University who was not involved in the new research. Sargent also believes that teens and youth seek out products because many e-cigarette products are designed — including their look, feel and taste — to appeal to a younger market. Posted on September 18, 2018 at 5:28 pm. 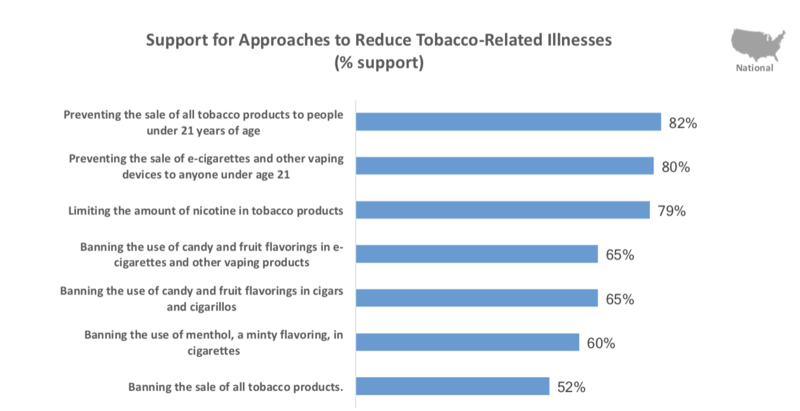 -52 percent of Americans support banning the sale of all tobacco products. The relevant findings were based on a nationwide survey of more than 4,000 people. Posted on August 31, 2018 at 3:21 pm. The CDC long recognized racial/ethnic disparities in tobacco product use among the largest racial/ethnic groups in the US. But, they wanted to know more about tobacco use among youths. 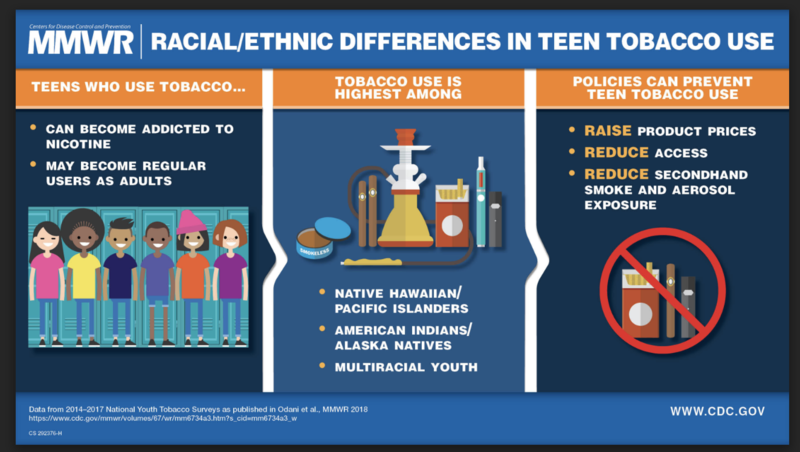 Pooled data from the 2014 – 2017 National Youth Tobacco Surveys were used to assess use of cigarettes, cigars, smokeless tobacco, e-cigarettes, hookahs, pipes, and bidis among US middle and high school students from white, black, Hispanic, Asian, American Indian/Alaska Native, Native Hawaiian/Other Pacific Islander, and multiracial students. Among highlights are highest current tobacco use is among Native Hawaiians / Other Pacific Islanders and lowest tobacco use is among Asians. E-cigarettes are the most commonly-used tobacco products overall. The paper noted observed disparities in tobacco product use might be attributable to racial/ethnic variations in targeted tobacco industry advertising, marketing, and promotional activities. campaigns, bans on flavored tobacco products, and raising the minimum legal sales age of tobacco products to 21 years. Posted on August 20, 2018 at 5:57 pm. Researchers determined that more than half of retail stores may be inadvertently, and illegally, selling cigarettes to underage buyers, according to the results published in JAMA Pediatrics. Federal estimates are based on single visits to stores, the researchers note. The new study was based on six visits per store by teens too young to purchase cigarettes. Sometimes the teenage buyers were turned away, but sometimes a clerk at a store that refused one teen would allow another to purchase cigarettes. “Policy makers need to understand that the way they are monitoring illegal sales from retail stores is pretty seriously flawed,” said the study’s lead author, Arnold Levinson, an associate professor of community and behavioral health at the Colorado School of Public Health in Aurora. 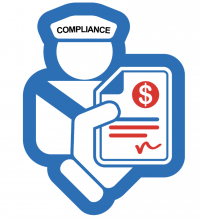 With the government underestimating illegal sales, it’s unlikely there will be stricter enforcement, Levinson added. For the new study, Levinson and his colleagues rounded up 17 clean-cut teens between the ages of 15 and 16. The teens were sent into 201 convenience stores, liquor stores, groceries, gas stations and other tobacco retailers in Colorado’s Jefferson County to try to purchase cigarettes. The teens were told it was up to them whether to present an ID if asked for one. Most did. But in many cases the clerks gave the ID only a cursory glance and then handed over the cigarettes. The researchers determined that 55 percent of retailers sold cigarettes during at least one of the six visits by the underage study volunteers. And 53 out of the 201 stores, or just over 24 percent, sold to the minor volunteers at least twice, while 24 out of 201, or about 12 percent sold to the volunteers three or more times.